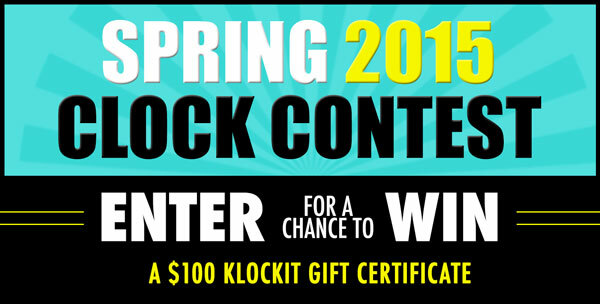 The Klockit team is happy to announce the much-anticipated Spring Clock Contest is here! Starting March 2, submit your latest clock project(s) for a chance to win one of three $100 Klockit gift certificates. Thank you to those who submitted feedback from previous clock contests. Your feedback helped us create a better clock contest experience for all this time around. We hope you’ll enjoy the three newly revamped submission categories and judging criteria! NOTE: Your entry must include which category you are submitting in to, at least one photo of your clock, and the story behind your project. All entries must be received by 11:59 p.m. CST on March 31, 2015. (1) Best Use of Parts: Judged on picture(s) provided and story of Klockit parts used in your project. (2) Gift of Time: Judged on picture(s) provided and story of satisfaction and joy of giving the clock as gift. (3) Most Creative Clock: Judged on picture(s) provided and story of what makes the clock original. Winners will be announced and contacted the first week of April 2015. When the winners are decided, they will be announced here on the Klockit blog and on the Klockit Facebook, Twitter, and Pinterest Pages. Post your question on this blog post below or on our Facebook and Twitter pages.